Swiss Strawberry and Walnut Cloud! It’s not a cake, it’s a cloud. 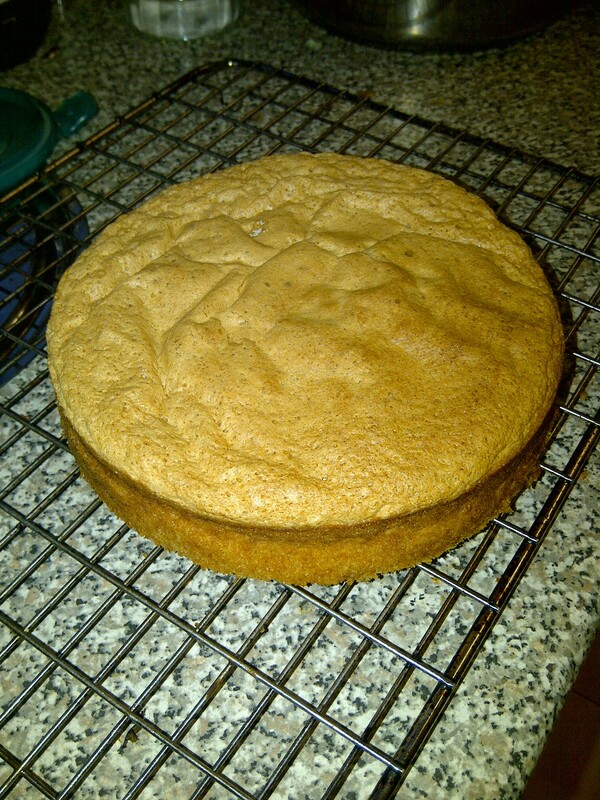 My housemate pointed this out and I completely agree – it’s the lightest cake ever, definitely a good summer recipe! Or winter…spring…autumn….whenever really. It’s also incredibly easy, and doesn’t need butter (I made it on a whim when I didn’t have any butter in the house, so that was the main criterion in my recipe search). It’s a Mary Berry again, I haven’t fallen out of love with her yet. 1) Preheat the oven to 180°C/350°F/Gas 4. Grease and line a 20cm deep round cake tin. 2) Whisk the eggs and sugar together in a large bowl until you get quite a thick mixture, which leaves a trail if you take the whisk out. This bit takes quite a while so don’t give up! 3) Sift the flour in, add the walnuts, and fold both ingredients in gently, mixing it as little as possible. 4) Turn it into the prepared tin and bake it for 40-45 minutes/until well risen, golden and firm to touch. Allow it to cool in the tin for a few minutes, then remove it from the tin and cool it on a wire rack. 5) When it’s cold, cut the cake into 3 thin slices horizontally. This is quite difficult, because the cake’s super light and then you hit the walnuts, so do it really carefully otherwise the slice will break. Maybe get someone to help you hold it steady. 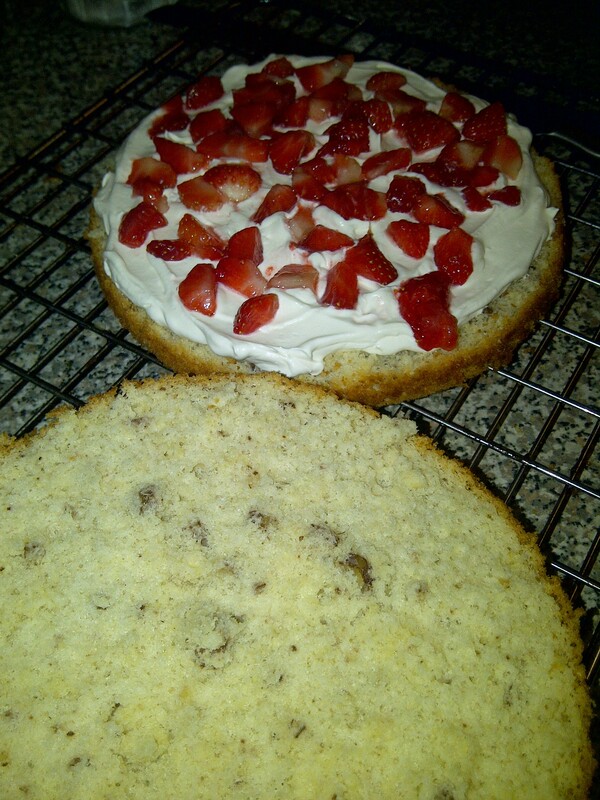 6) Cover the bottom slice with whipped cream then sprinkle with strawberries. 7) Put the middle slice on top of the bottom one, and do the same again. The put the top slice on, and cover all over with cream. Put however many strawberries you have left on the top! I think traditionally you’re supposed to cover the top entirely with strawberries but I didn’t have enough. Hope you enjoy it! Such a light delicious recipe – a nice alternative to most of the cakes and desserts knocking around at this time of year. Speaking of which, I’m currently in the process of making my first batch of mince pies so expect a more seasonal recipe post in the next week or so! 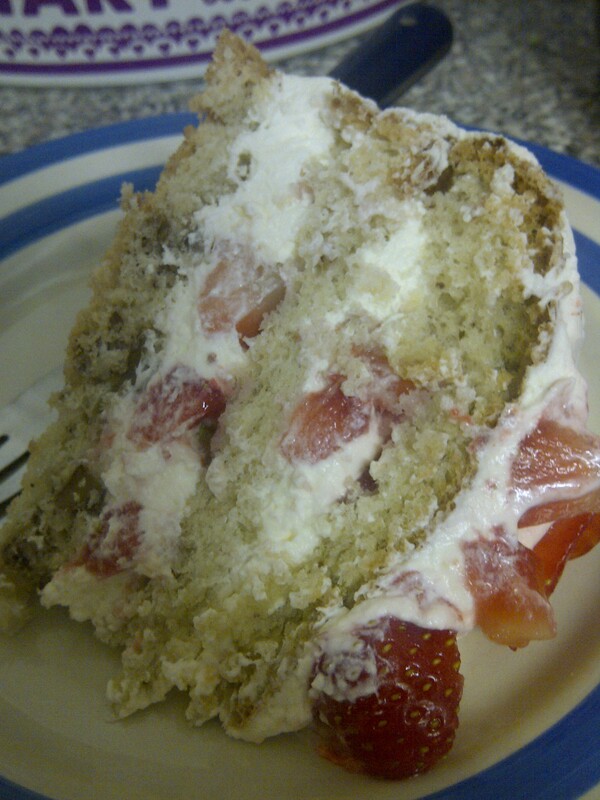 This entry was posted in Cakes and tagged baking, cake, cream, recipe, sponge, strawberry, walnut. Bookmark the permalink.